Raise a Green Dog! : Part 4: How to make your own healthy, safe laundry stain remover for the health of your dog! This is the final post as part of our focus this month on how to clean your laundry the healthier and safer way for the health of your dog and the environment. Today we are focusing on how to remove those nasty stains in your clothes when your regular detergent just isn't enough. I'm a dog and I get dirty, especially running around like a crazy dog around our cabin, hiking in the woods, and running at agility trials. That's my sis Gracie after a nice romp in the yard, can you imagine how Mum looked after playing with her? Mum seems to always have dirt on her after our activities. And almost always needs to treat her clothes and our beds before washing to make sure and get all that tough Georgia red clay out. Fragrances that are unlisted and undefined that have been proven to create respiratory illnesses, allergies affect the nervous system and more. Mix all the ingredients together and stir. Store in a spray bottle and you can spray those nasty stains before putting into your wash. Mix together and place in a dark spray bottle. 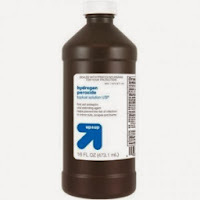 You may want to use a sprayer from another bottle and add to the hydrogen peroxide bottle to make it easier. Brighten your whites by hanging them in the sun! The sun is a powerful stain remover and can get those whites, super white. And some of our friends swear by adding about 1/2 cup of white vinegar to the rinse cycle to help whiten whites and get rid of stains. In addition, some like adding just 1/2 cup of hydrogen peroxide to the rinse cycle and believe it works very well. One more idea is to add about 1/2 cup of baking soda to your laundry detergent to make it more powerful and stain fighting. You can also use these recipes on your carpets and rugs for muddy, dirty stains. They also work well for quick clean ups in the kitchen, bathroom and more! Just test for color fastness first. We hope you've enjoyed our green, eco-friendly, healthy and safe laundry tips. We know you're dog will love you for it and pay you back in spades with a long and healthy life. Photo: Emily Katherine May on Flickr. This is an awesome blog! I've been searching for some "green" alternatives. Thanks for sharing your knowledge and expertise. I will be back here again! Very interesting and informative article. I was wondering...isn't there 'pet-save' laundry cleaners on the market then? Sure some manufacturer must have thought of these dangers that regular ingredients in laundry cleaners pose? 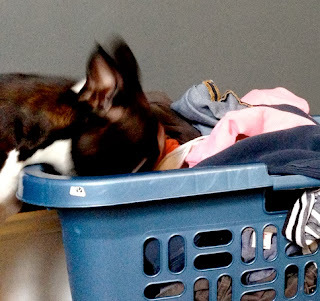 Yes there are 'pet-safe' laundry cleaners. Check our other laundry posts for recommendations. Thanks! This is a great alternative. I made some last night and it worked wonderfully. Thanks for sharing! These are great green alternatives. I know for a fact that lemon juice with hydrogen peroxide gets rid of rabbit pee stains- one of the worst stains you can get on your clothes. This is a refreshing post! All I have been seeing lately are commercial products. Whenever I use them my allergic rhinitis attacks. I hope you can post some natural deodorizing liquid of some sort. My detergent can't seem to take care of the odor my dog leaves when he urinates. Thank you for this helpful post.